Many things besides fertilizer go into having a nice lawn that is the envy of the neighborhood. No amount of fertilizer will help if you don’t start from the right place. If you are starting a new lawn Green Zebra can level your yard with clean fill if needed; then add a layer of the company’s own blend of top soil. Our supplier blends our soil to our own specifications because top soil can vary from one supplier to another, and even month to month, from the same supplier. Suppliers don’t make top soil. They mine their top soil from building sites and stock-pile it until it gets sold. This means the soil is only as good as the soil was at the site it was removed from. Green Zebra requires suppliers to add specific ingredients to this soil to always have a quality growing medium. This blend helps the soil retain moisture and remain less compacted. 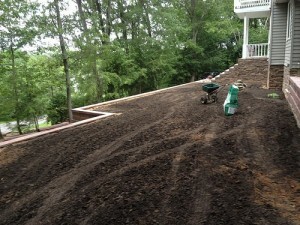 If the soil in your yard isn’t dark in color, or almost black it will probably benefit from top soil. Good plants come from good seeds. Green Zebra typically uses a tall fescue or perennial rye based on the conditions of your property. They both provide a thick, lush lawn. When planting a seed in your vegetable garden you don’t put the seed on top of the soil. You bury it. In the same way, spreading grass seed across the top of your soil will yield very poor results. If you are adding top soil for a new lawn or repairing an established lawn, Green Zebra has the tools to get the job done. We have a front end loader used to level your lawn and spread top soil. This machine is small so we can get into areas other machines can’t and it is light-weight so it does not damage your property. Green Zebra uses an aerator to ensure good seed to soil contact. Every year gardeners rototill their gardens. This is in a large part to loosen the soil, because plants have a difficult time growing though compacted soil just like your finger has a hard time pushing into soil. While you don’t want to destroy your lawn every year by rototilling just to loosen the soil, aeration will loosen your soil without destroying your lawn. We have two different types of aerators depending on the needs of your lawn. One is used to loosen heavily compacted soils such as when the soil is very dry. This aerator can go through the hardest soils. Our other aerator works well on moist, lightly compacted soil. Dethatching is a process where some form of rake is run across a lawn to remove thatch. Thatch is a buildup of a root layer that is almost impermeable to water, fertilizer and air. Many people incorrectly believe that thatch is a buildup from not bagging grass clippings. Thatch can be caused by watering incorrectly, using the wrong fertilizer, too much fertilizer or a combination. The clippings will break down and add nutrients to the soil. However, other debris, such as leaves, may make dethatching very important. Leaves that fell during the winter or were blown onto your yard become matted down, suffocating the grass, and a good dethatching will clean your lawn very well. Therefore, dethatching is an ideal service to do in the spring when you are getting your spring cleanup done or any time your lawn is suffering from a thatch problem. PH is the measure of the soil’s acidity level. 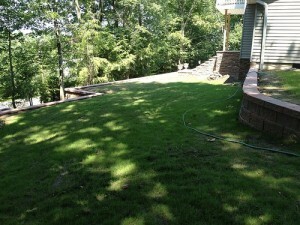 If the soil is too acidic or too alkaline, your grass will struggle, no matter how much water or fertilizer you use. In the northeastern part of the country the PH of our soils tend to be acidic. Green Zebra applies lime to your soil to correct this. The only way to tell if your soil is acidic is with a soil test, which means lime should not be applied on a schedule but should be applied only when a test calls for it. We have the tools to monitor the PH levels of your soil.